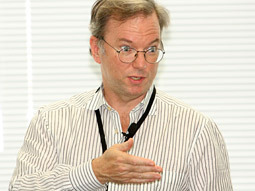 “We don’t actually want you to be successful” said Google CEO Eric Schmidt. The company’s algorithms are trying to find the most relevant search results, after all, not the sites that best game the system. “The fundamental way to increase your rank is to increase your relevance,” he added. – The tools are ready: Brands and businesses in general can now own the distribution of their content and directly connect with their constituents and customers via social networks and RSS connectivity. This is the ultimate form of business relevancy as regular people (or businesses) are connecting via the internet to businesses they believe are trustworthy. Google is looking for trust, are you? – You own distribution: Business blogging, and blogging in general, is the mothership of relevancy. A business should (not increase) but shift resources from traditional marketing to blogging. You may also need to reshuffle who is in charge of blogging (hint)…. Comcast’s success with Twitter was started by people in customer service, not in corporate marketing. The spirit of blogging resides in creating real connections with customers. Help your customer, make them smarter, educate them. Traditional marketing minds want to push information. Blogging is about pulling your customer’s interest towards the higher purpose of your business. Together we rise. – The Digital Footprint: What the heck is that? 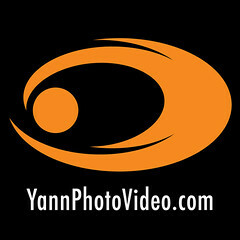 The other day, I followed someone on twitter someone called Pixelbender (this makes me laugh as it expresses the gap between our understanding of reality and how the virtual world is reframing what’s really real) 🙂 – Back to the digital footprint… I see it on every network, from the LinkedIn super networker who has 10,000 + connections (Not me, but I’m working on it) or to Obama who has 100,000 + followers on twitter (first page result for Barack Obama) – the more connected your business is (and you are yourself), the more relevant you become in the eyes of the search engines. Your business digital footprint is like putting a series of billboards along social network highways. The earlier you get on board, the more you’ll lead in terms of being relevant in your industry. Stay or become relevant through social media! – The Business Social Graph: To our example last week, just put Barack Obama in Google, or check where Twitter is lined up… like on the first page – that is relevancy based on how much a person or a business is connected. 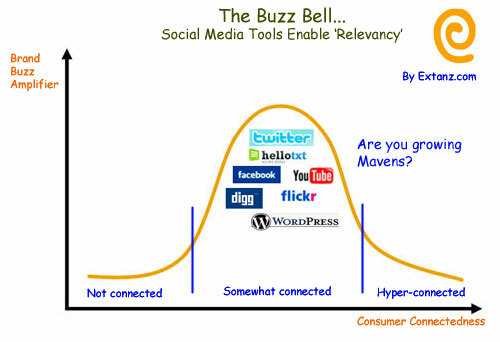 Except that once again, the internet tends to create sprouts (remember the Bell Curve?) – The first cool brand on the block will be able to build higher and faster connectivity with customers and prospects because of the viral mechanism that the internet offers. How do you stay on top? By staying relevant and feeding EXCELLENT and USEFUL content to you constituencies!